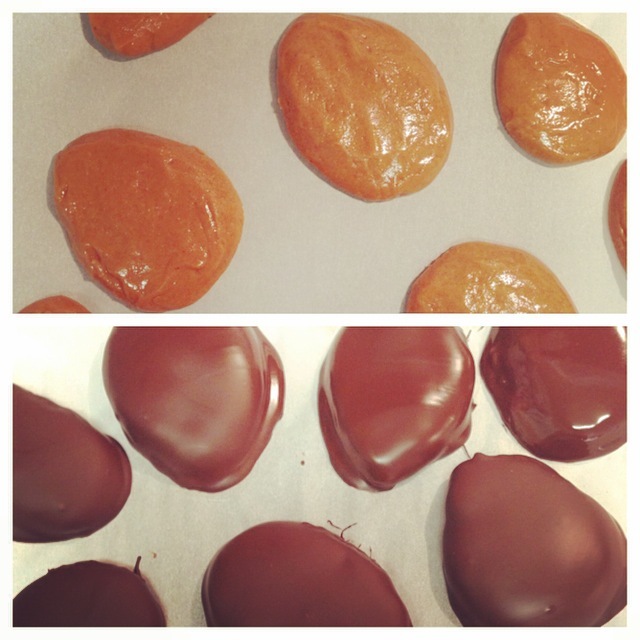 Craving Reese's Peanut Butter Eggs? Try this low carb version this spring! Mix the no sugar added peanut butter, sugar free maple syrup, coconut flour, and salt (if desired). Stir, until a uniform batter forms. Using a spoon, scoop the batter into 6 balls (depending on the size you like), and shape the dough into egg-like shapes with your hands. Arrange the eggs shapes on a plate lined with parchment paper, and place in the freezer to set. While the peanut butter middles are setting in the freezer, melt the sugar free dark chocolate chips in the microwave or on the stovetop and stir in the coconut oil. Remove the peanut butter middles from the freezer, and dunk into the chocolate mixture one at a time, completely coating them in chocolate. Remove from the chocolate with a fork and return the chocolate covered pieces to the parchment paper. You can spoon additional chocolate over the tops for a thicker coating, if desired. Return to the freezer to set for at least 10 more minutes before serving. For best texture, store and serve directly from the freezer. The chocolate will soften if left at room temperature for too long.